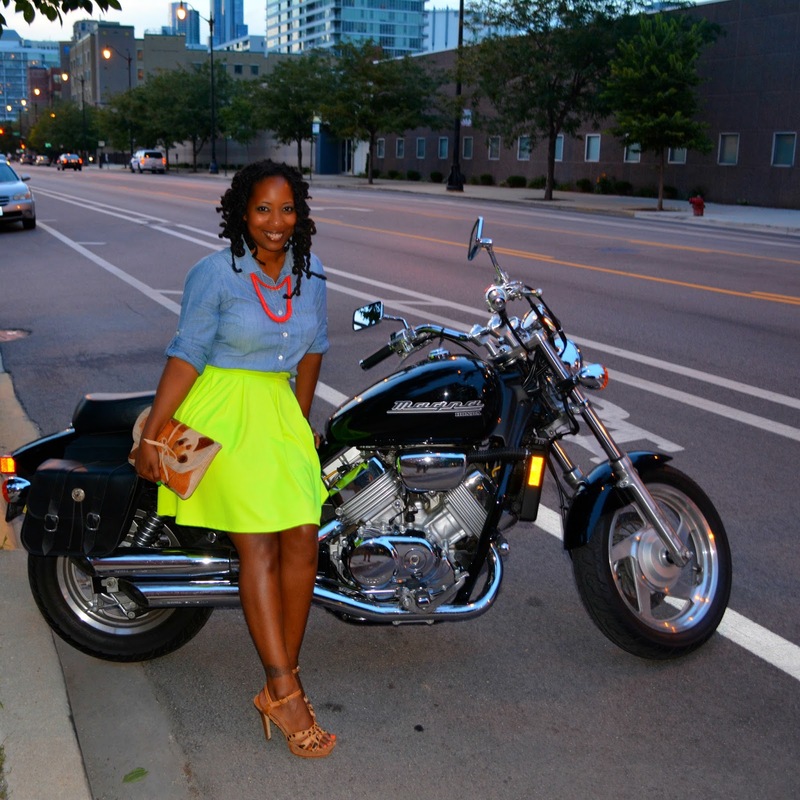 My mama hooked me up with this neon skater skirt. She wore it once for a retro party at her retirement community and was done with it so she shipped it to me. She told me she was sending me a mini skirt but I had no idea it would be this awesome. 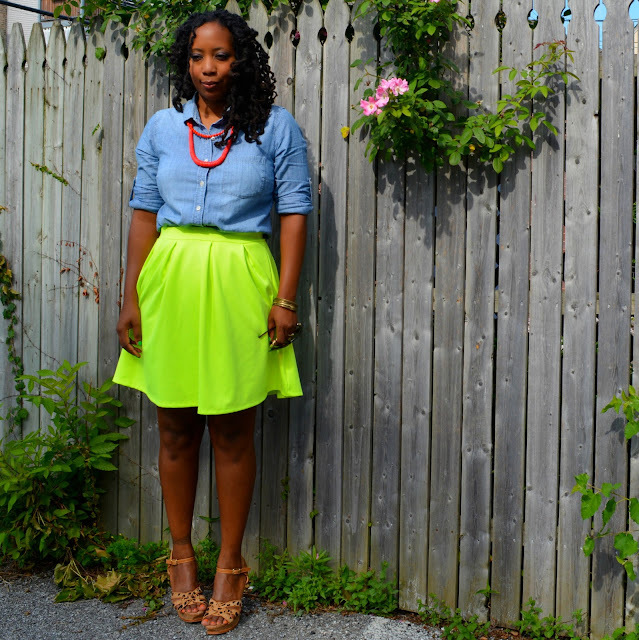 I wore it last week to Liptstick and High Heels, a party hosted by Trina of Baby Shopaholic. I had a great time meeting online friends in real life. You can see pics from the event on instagram #lipsandheels. If you have a spicy mama like mine, check her closet. Given the brightness of this skirt, it shouldn't be to hard to spot in a thrift store. As this is a super current trend, you may have better luck in a chain consignment store like Crossroads Trading or Buffalo Exchange. You can easily turn a thrifted white skirt into a neon skirt with a DIY dye job! 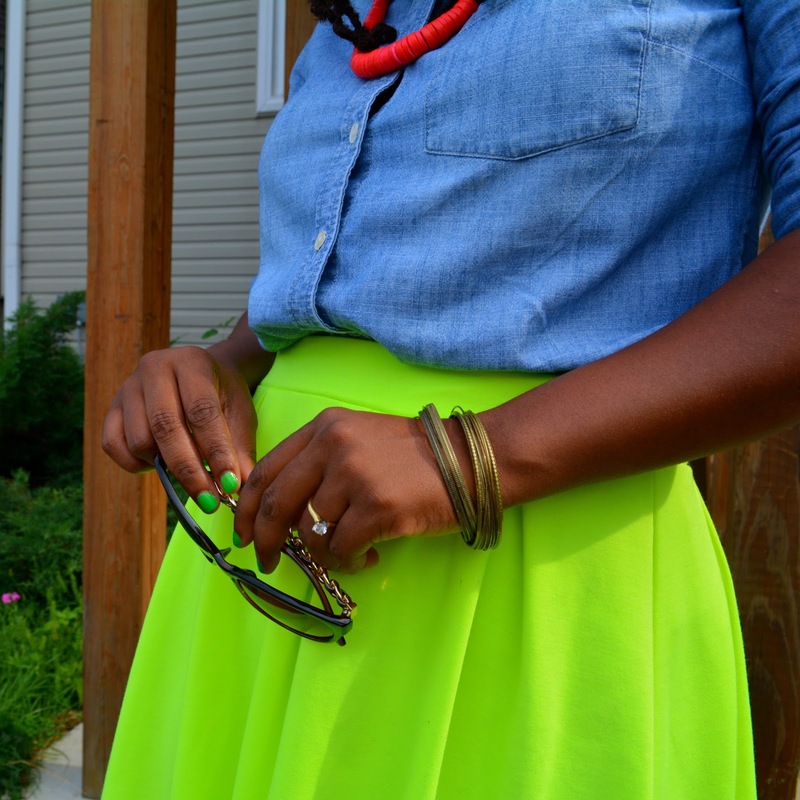 A skirt this bright doesn't need much. White, black, animal print or denim basics all work on top. Be care when opting for brightly colored printed top unless you're going for a 90s look. Crop tops and a skater skirt. Match made in trend heaven. 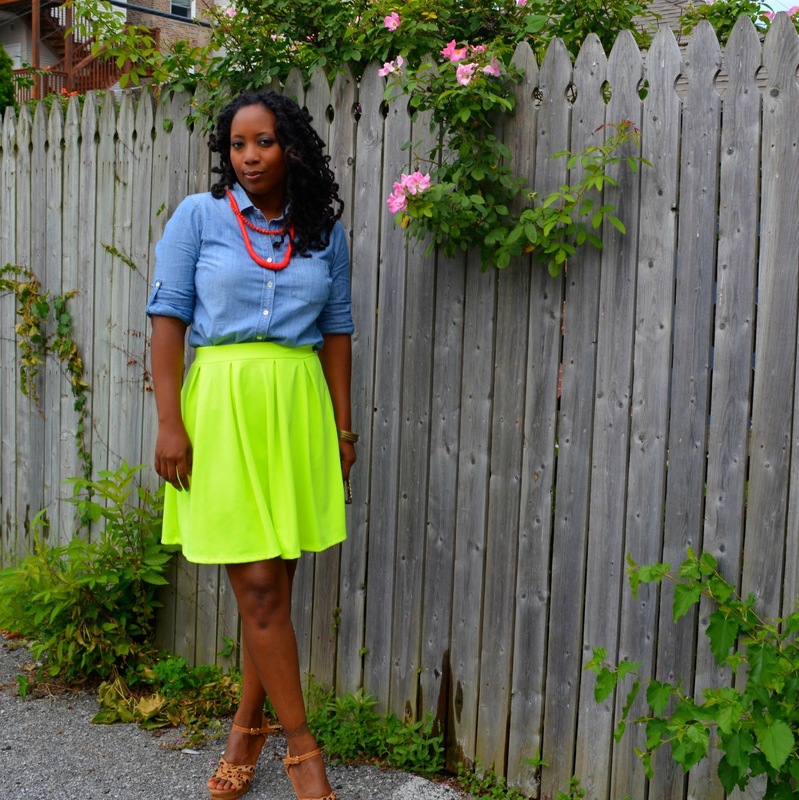 There's no low key way to wear a neon skirt. Be prepared for a ton of compliments. Visit my skater skirt pinterest board for more inspiration and style ideas. Did you know Google+ could do this? It took a bunch of my photos and put them in motion. Mind blown. How did I miss you at Lipstick and Heels? I love your posts and that we are sisters in thrifted fashion. That skirt is amazing! I didn't know that google + could do that! Crazy awesome! I love that you did the small red necklace with the bright skirt. Trendy! Google+ can make you dance? That is fabulous. Your mum must be a sassy fashionista! Great skirt. Wow this skirt is amazing! I love the shape, normally I feel like I only see neon in bandage styles. Oh gosh!!! Fabulous skirt! Can't believe your Mom gave it up!!! Great look! Cute, your mom has great taste. Like the motion pics! Nice! Loving your mom's choice for the skater skirt. Found out about your blog recently... LOVE! I love the color of that skirt on you!! Plus the chambray with the neon just looks fab! So fun! I need to try this myself with G+!! Love the skirt and the entire look. And I've gotta try the G+ trick. OK...so your mom has superb style for owning such a gorgeous skirt. And how nice of her to send it over to you. 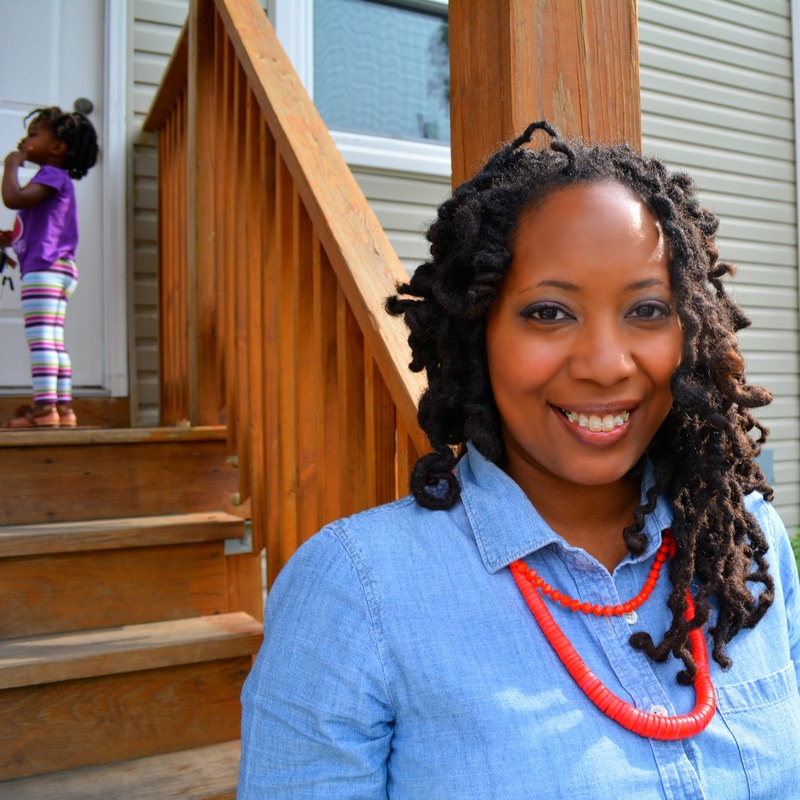 Your hair is growing so much too-it's gorgeous; loving those curls! I gravitated toward this skirt right away. Perfect outfit, so cute!